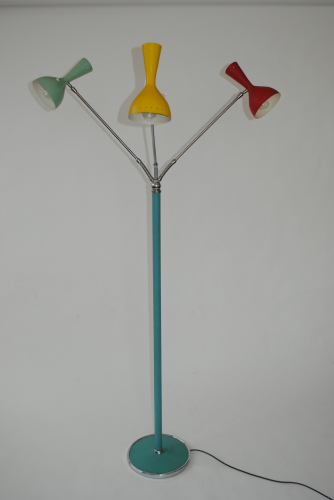 Rare and very beautiful floor lamp attributed to Arredoluce, Monza, Italy 1950`s. 3 lacquered aluminium shades (original lacquer), with light fittings to the front and rear of each shade, supported on a chrome plated brass and blue leather base and stem. The base is 30 cm in diameter.